Premier Quality, Long Staple, Highly Mercerized Egyptian Cotton with a Matte Finish to Create a Soft, Warm, Natural Look and Feel. 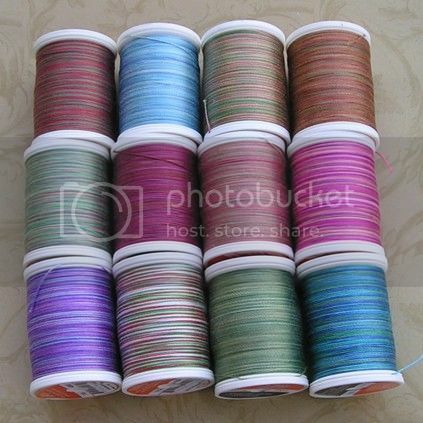 These exciting new multicolor threads are a masterful blend of different colors within the same range of tone and intensity, with random, subtle color changes every 2-1/2 to 5 inches! No thread has ever done that before. They will add excitement to your quilting and everything else you do. They're made of the highest quality, long-staple, 100% Egyptian Cotton, made in Italy. They're so ideal for quilting, thread lace, bobbin work, thread painting, red work and decorative embroidery. 12 wt has 330 yard in each spool.